Over the years I’ve written about dozens of ideas and instructions for how to make every kind of “Gift in a Jar” imaginable (collected into one place here). I thought we’d exhausted the topic. Well, I was wrong. Look what I made. These are single-serving Mini Pumpkin Pies in a Jar. I got this great idea from our friends at Our Best Bites. And yes, I’m talking about making, baking, serving and even gifting homemade pies in half-pint (8-oz) canning jars. I’ve experimented with all kinds of pies and so far, every variety has turned out great. Traditional pie recipes translate easily to these little cuties. I’ve made double-crust jar pies with crumb topping, even cream pies. I’ve frozen them unbaked and baked them weeks later. I’ve baked them, then applied the lids and frozen them for later. I’ve given them for hostess gifts, birthday gifts and Christmas gifts, too. These pies are just as adorably cute as they are delicious and practical! Making Mini Pies in a Jar is easy as pie! You will need clean, sterile oven-proof jars (like Kerr or Mason), crust and filling. Half-pint jars come in various shapes. For these pies, you will want the short, squat, straight side, wide-mouth variety, like these available on Amazon. Once baked, cooled jar pies are ready to have their little lids and rings applied, then embellished for gift-giving. Or get your pies ready for the oven, then apply the lids and rings and freeze them instead. Then you can bake one at a time or as many as fresh pies as you need. Process 1 1/2 cups flour, salt, and sugar in food processor until combined, about 2 one-second pulses. Add butter and shortening and process until dough just starts to collect in uneven clumps, about 15 seconds. Scrape bowl with rubber spatula. Add remaining cup flour and pulse until mixture is evenly distributed around bowl 4 to 6 quick pulses. Empty mixture into medium bowl. Sprinkle vodka and water over mixture. With rubber spatula, use folding motion to mix, pressing down on dough until dough is slightly tacky and sticks together. Divide dough into two even balls and flatten each into 4-inch disks. Wash and dry as many half-pint wide-mouth tempered glass canning jars with lids as needed. Use the dough to line the ungreased jars. Begin at the bottom, pressing pieces together and inching your way up and around the sides, sealing any gaps. Make sure it’s pressed all the way up and over the top of the jar, so as to have enough to make a “rim.” Don’t make the dough too thick, but similar in thickness to a traditional pie. To make the top crust for Mini Pumpkin Pies, roll out dough. 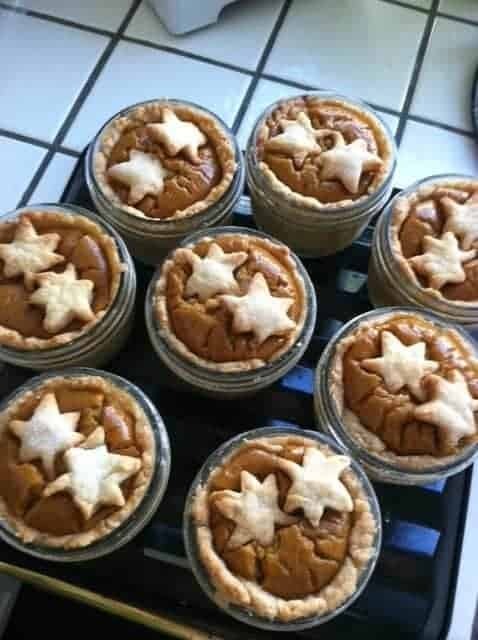 Cut out tiny cookie size leaves or stars to embellish your Mini Pumpkin Pies. Set aside. Bake these separately then place on top of the pies while still warm, like a sweet garnish. Add the sugar gradually to the pumpkin puree. Beat well and stir in the flour, salt and spices. Stir in the corn syrup and beat well. Stir in the slightly beaten egg, then slowly add the evaporated milk, mixing until well blended. Pour the batter into the unbaked pie dough-lined jars. Leave about one inch head room as the pumpkin will expand as it bakes. Bake at 450 F for 10 minutes then reduce the oven temperature to 325 F and continue baking for an additional 25 minutes or until a knife inserted into the mixture comes out clean. Watch carefully as these will bake faster than an entire pie. To bake directly from freezer, preheat oven to 375 F. Remove lids and place jars on a baking sheet. Bake for about 50 minutes or until the tops are golden brown and the fillings are bubbly. Cool. These can be eaten directly from the jar or popped out of the jar and onto a serving plate. Many thanks to Our Best Bites blog for this great idea. You’ll find more details, photos, recipes plus a tutorial HERE.